Computer engineering is the design, development and integration of computer programs and technology into devices and systems that improve how we interact with our world every day. Computer technology is built into almost every new product today. Computer engineering graduates design "smart" devices such as cellular phones, GPS navigators, video entertainment systems, medical imaging, monitoring devices and much more! Through this program you can become part of this rapidly growing, leading-edge field. The undergraduate program presents a challenging and interesting workload. The first two years of classes are specialized in technical and design-based principles. We offer the advantage of small classes, large lab facilities, superb faculty and excellent support staff. 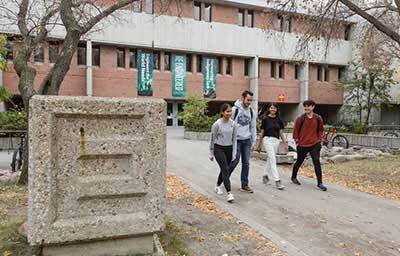 All first year engineering students will take a common set of classes before entering a specialization, such as computer engineering, in their second year. Introduces the fundamental concepts and techniques for the modeling and analysis of discrete-time signals and linear systems. Topics include: sinusoids and complex exponential representation, Fourier series, sampling, reconstruction, discrete-time representation of signals and systems, linear time invariant (LTI) systems, finite impulse response (FIR) filters, frequency response, z-transforms, infinite impulse response (IIR) filters and Fourier analysis. MATLAB is introduced using simulation-based laboratories that explore analysis tools and their applications. Covers the architecture and operation of microprocessors and memory devices, linking together of logic devices. The assembler language is introduced to program low level functionality of microprocessors. Covers the verification of digital circuits and systems with emphasis on SystemVerilog, a verification language. It starts with the basics, such as functional verification methodologies, and SystemVerilog fundamentals, and gradually builds to more complex examples and advanced topics. At the end of the course, a complete verification system is created using SystemVerilog. You will use state-of-the-art technology in the lab to learn, experiment and test your ideas. From our wind tunnel to our anechoic chamber, our facilities can help you make textbook concepts tangible. You can work with students from your classes and other disciplines to get the most from your education, whether working on homework, building a space elevator, racecar, remote control plane or art display, or finishing a design project. You will complete several design projects throughout your degree, but perhaps the most exciting is the fourth-year Capstone Design Project. The Capstone Design Project allows you to apply top-down design principles to a year-long project, starting with a basic description of the product or system and culminating in a presentation of a final working design. You will gain first-hand experience in the application of a formal design process while earning credit toward your degree. Our engineering students have a reputation for helping out and supporting our local community, the world’s developing nations and everywhere in between. Our students have accomplished amazing things in the areas of space design, mining competitions and agricultural design, and have been involved in projects where they aim to make a difference in developing nations through providing access to clean water, food and sustainable energies. Whether you are interested in refining your creativity skills by collaborating with art students, developing a product to help someone with accessibility needs, traveling across the world to help build a well in Africa or designing/building a race car or airplane, we have a student group for you! The Engineering Student Centre works very hard to support students academically through advising and administering facilitated study sessions every week. The Bachelor of Science in Engineering degree is a four year program offered by the College of Engineering. You will learn how to negotiate the political, rhetorical, ethical and interpersonal challenges of communicating in a professional environment. You can complete this Certificate during your Bachelor of Engineering degree. The Engineering Professional Internship Program is a full-time internship opportunity which includes a minimum of eight months of professionally supervised work experience. By participating in an internship, you're able to apply the theoretical knowledge you've acquired in your undergraduate studies in a practical and challenging workplace environment. As an intern you will earn a competitive salary and vacation pay, and may receive a benefits package. You will maintain your full-time student status during your internship. Interns gain practical and in-depth experience within a specialized field, develop strong interpersonal skills, write reports, present seminars and supervise others. These are employable skills that will allow you to better market yourself in a competitive job market. If you are looking for graduate level programs (Master's and PhDs,) please consult our graduate students' website.